Hostas have a great reputation for being pest and disease free. Other than foliar nematodes, gardeners could buy and trade hostas and not have to worry about bringing anything harmful into their garden. Unfortunately, this has changed. Not only are foliar nematodes out of control, but recently a disease has spread through the market place like wildfire. Starting about 1998-2000, a few "lucky" hosta growers began finding what appeared to be new, interesting sports of otherwise common hostas. These "sports" showed blue or green colored spots or blotches throughout the gold part of the leaf. While some people thought it was beautiful, others found it disturbing. A few individuals became especially concerned when these oddly marked plants began showing up in great numbers over the next couple years at many of the big chain stores and nurseries. 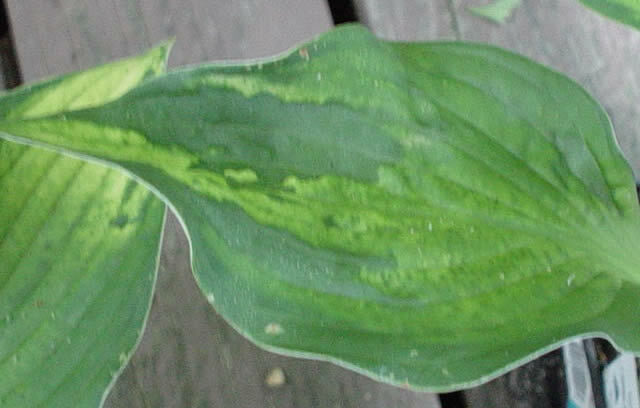 Dr. Ben Lockhart, of the University of Minnesota, discovered the cause of this mottled coloring: Hosta Virus X (HVX). It is unclear exactly where Hosta Virus X came from, but it is very clear that it has quickly reached epidemic proportions. 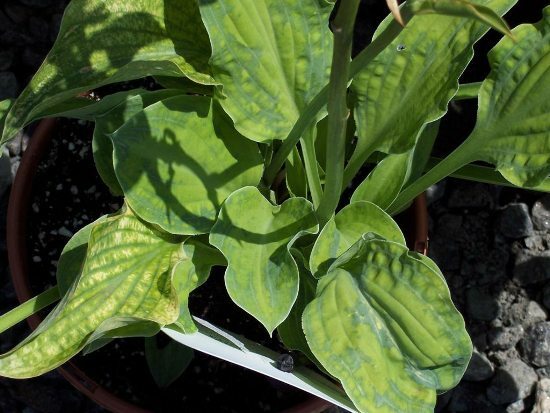 Hosta Virus X affects different hosta cultivars in different ways, so it is impossible to give a definitive description of symptoms. The classic visual symptom is blue or green markings on a light colored leaf. 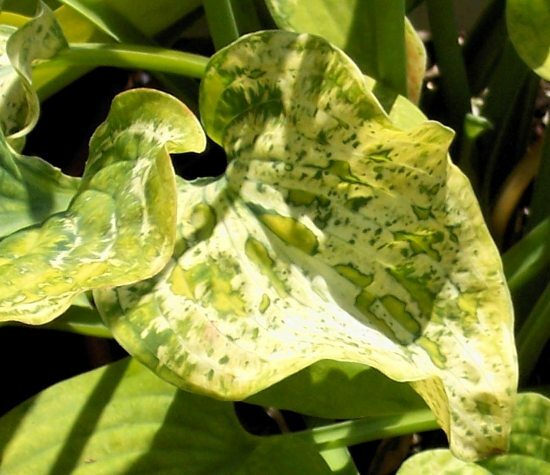 These markings usually follow the leaf veins and bleed out into surrounding tissue giving the plant a mottled appearance. Less common symptoms include dried, brown spots and twisted, deformed leaves. It may be difficult to detect off colored mottling on dark, solid colored leaves. Some green tissue will show lighter colored mottling along the veins, but it is often not as pronounced as the markings on gold tissue. Some dark colored Hostas appear as if they have had bleach spilled on them, though. 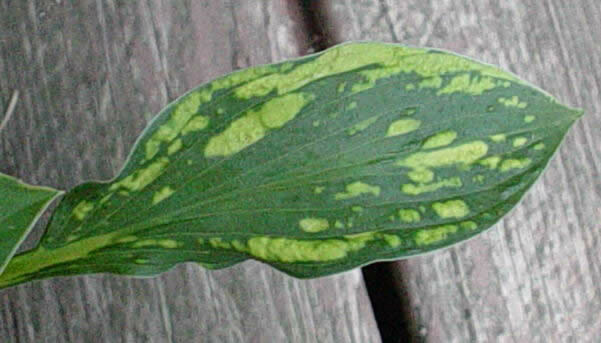 I have found that the texture of the leaf is often a sign of infection just as often, if not more so, than coloring. The leaf tissue of HVX infected plants often appears lumpy, puckered, and of different thickness or texture than healthy plants. Leaves often appear to have patches or streaks of sunken, wrinkled or collapsed tissue. These symptoms are subtle and require a sharp eye and practice. Spotting these textures can be nearly impossible on hostas that normally have heavily puckered leaves. 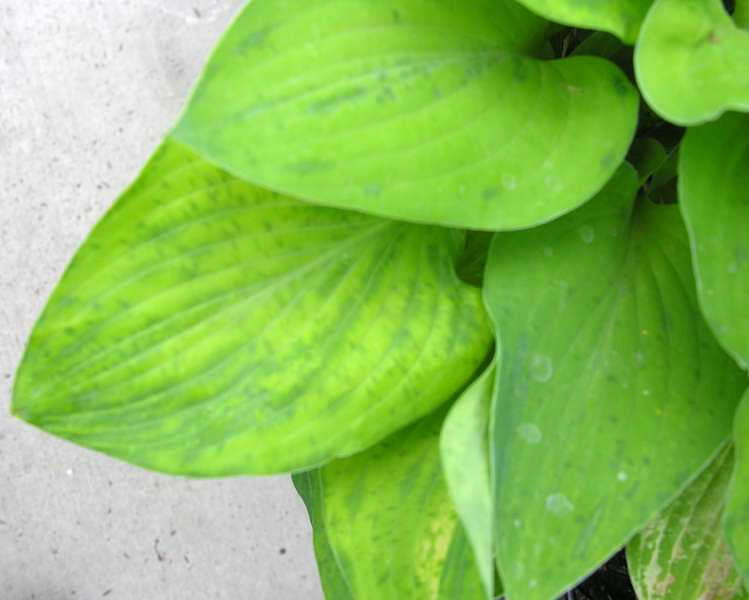 To make matters worse, some hosta cultivars don�t seem to show any visible symptoms of being infected with HVX and it may take a year or more for symptoms to show after a plant has been infected. The most obvious way for Hosta Virus X to spread is by sap from an infected plant being mechanically transferred to another plant. Unfortunately, this is easier done than one might think. Contaminated tools and hands can both spread the disease. Cutting roots while digging and trimming off damaged leaves and spent flower scapes can potentially transfer infected sap to healthy hostas. Researchers say the virus can not be spread by insects, slugs or other animals like rabbits and deer. Tissue culture is not the cause of this epidemic. HVX can survive the tissue culturing process, but most tissue culture labs screen their stock plants for multiple viruses before putting them into TC. 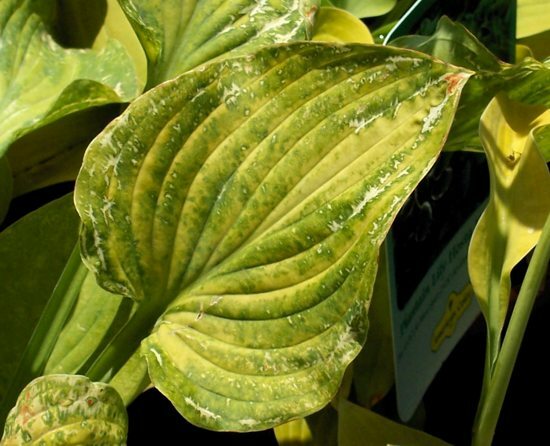 The main source of the Hosta Virus X epidemic is several large wholesale growers in Holland and a couple here in the US who have it in their growing fields. It is during the harvesting process that the virus is spread. Not only through digging and cutting, but many of the overseas growers power wash the plants in preparation for export. During this process, some of the outer layer of tissue is actually stripped off exposing sap that can infect other plants through their stripped tissue. 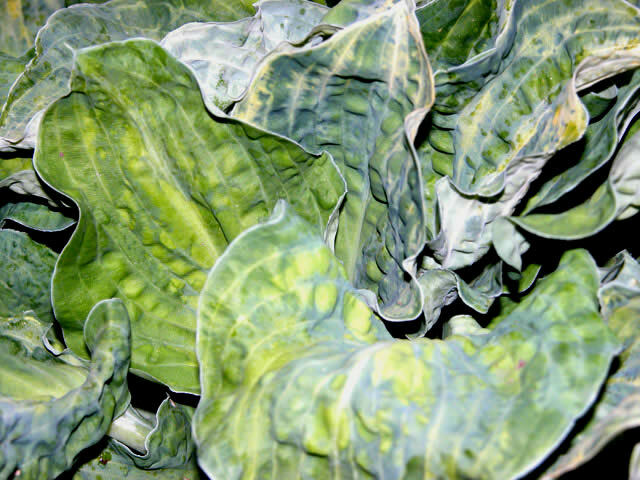 We are only just beginning to understand how Hosta Virus X works. While mechanical infection poses the biggest risk, researchers may discover other means by which HVX spreads. There is no cure for plant viruses and it is not safe to have virus infected hostas in our gardens. 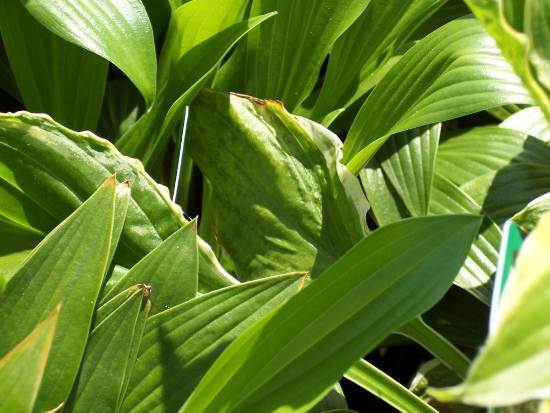 One study concluded that HVX could be transmitted through seed, but at the 2010 American Hosta Society Convention Dr. Lockhart said that he felt the study was not reliable. There are no proven cases that I am aware of where Hosta Virus X has been passed on to seedlings via pollen or seed. Other viruses closely related to HVX are proven not to transfer via seed or pollen, so it is expected that HVX behaves in the same manner. At the 2010 American Hosta Society Convention, Dr. Lockhart gave a key note presentation on the current findings of his AHS sponsored research. One particularly interesting finding was that Hosta Virus X is most easily transmitted in the spring when hostas are actively growing, and difficult, if not impossible, to transmit after a hosta blooms. Early research suggested that some hosta varieties were resistant to being infected with Hosta Virus X. Instead, it appears these "resistant" cultivars were not exposed to HVX at a time when they were susceptible to infection. So what does this mean for the gardener and nursery grower? This research suggests that late summer and fall may be the safest time to dig and divide plants to minimize the spread of HVX. I am not, however, saying that it is safe to ignore proper disinfecting practices for tools when working with plants in the fall! Only that fall division may be one more precaution we can take to protect our gardens. 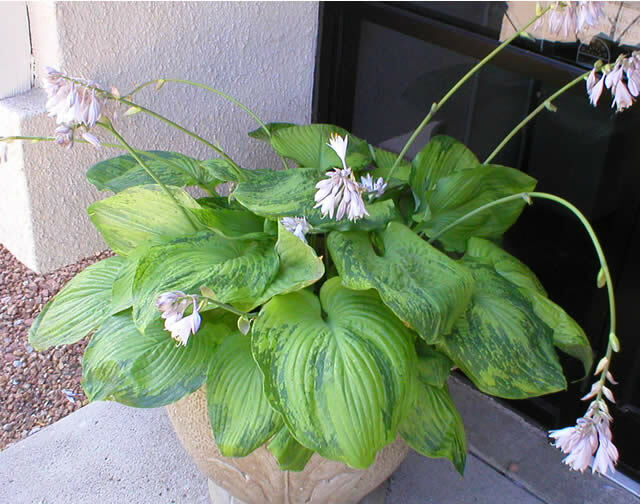 The best way to prevent Hosta Virus X from infecting your collection is to simply not grow infected plants. Always avoid strangely spotted or mottled plants you find at nurseries. Not all infected plants show visible symptoms, though, so if one plant in a group shows symptoms do not buy healthy-looking plants in the same group. If one has it, it is very possible some, and maybe all, of the others do. Any plants that came from the large bulk wholesalers should be considered risky. 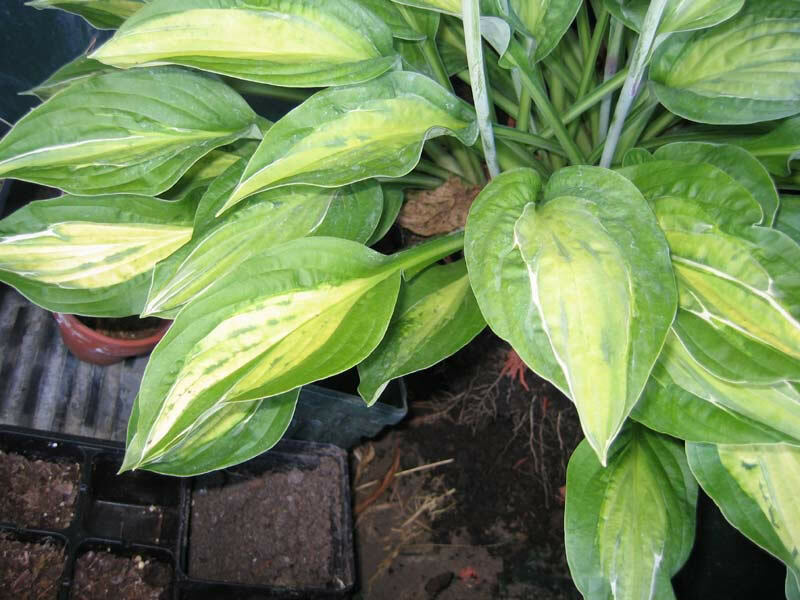 This includes most hostas found at the "big box" stores. Watch for signs of HVX, don't cut them, and throw them out if any suspicious symptoms appear. A decontamination protocol for tools has yet to be developed, but whenever you are dividing or trimming plants, always clean your tools between each plant. Straight bleach, rubbing alcohol, and hospital grade Lysol mixed according to directions are all possible sanitation solutions. It is generally said to thoroughly wipe clean tools, as opposed to dipping. The following hosta varieties have tested positive for Hosta Virus X. The plants tested came from different growers and collectors. This DOES NOT mean all plants of these varieties are infected with HVX, only that some plants of these varieties have been infected and circulated through the market. By far the most commonly encountered infected variety is 'Gold Standard'. 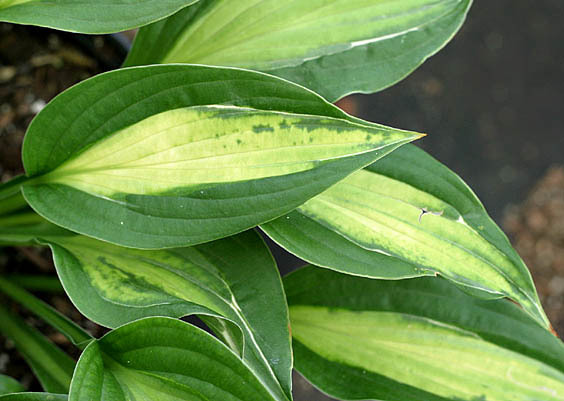 Early research suggested that some hosta varieties were resistant to being infected with Hosta Virus X, but it is best to assume all hostas can be infected. Before much was known about viruses in hostas, some infected plants were given names. All plants of these varieties ARE infected with a virus. 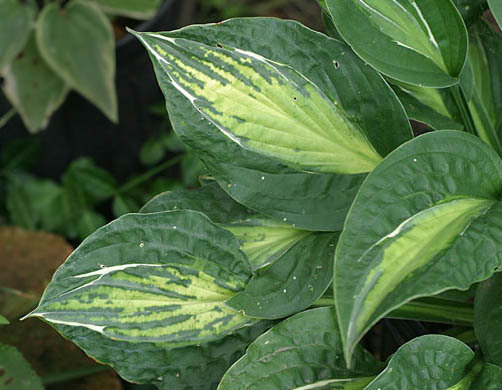 Some are infected with Hosta Virus X, some may be infected with other viruses. Hosta 'Breakdance' showing typical Hosta Virus X symptoms. 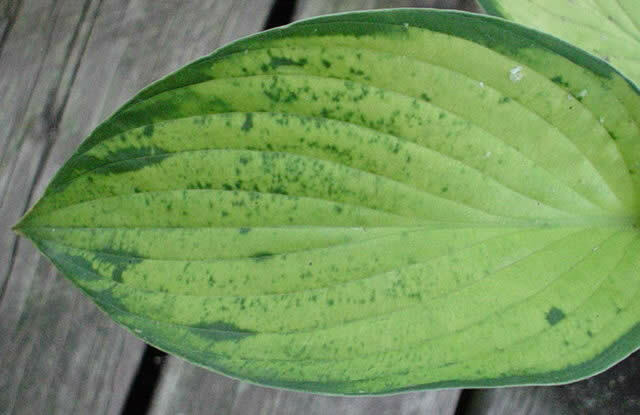 A few interesting hosta varieties show the mottled pattern that is common in virus infected plants, but are in fact free of Hosta Virus X. There are a couple slight differences in the way these plants display the markings. The markings in the HVX free plants are more random and do not follow and bleed out from the veins as they do in HVX infected plants. The markings in the HVX free plants are also very dependent on light exposure. The markings can be lighter or darker depending on the amount of light the plant receives. Markings in HVX infected plants are not affected by light intensity. 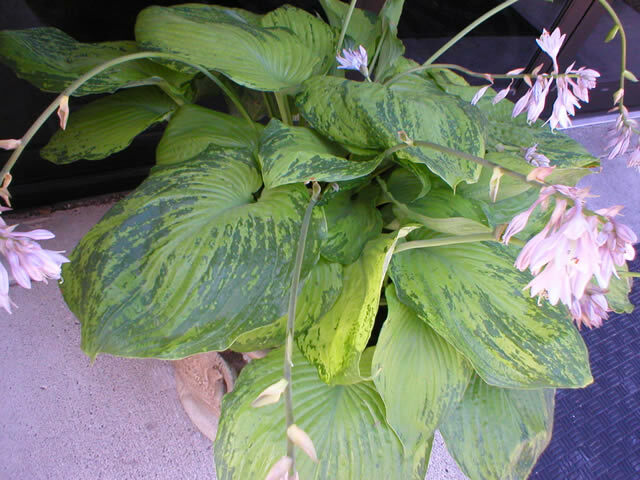 Hosta Virus X free, mottled plants also commonly fade to a solid color by the end of the season. 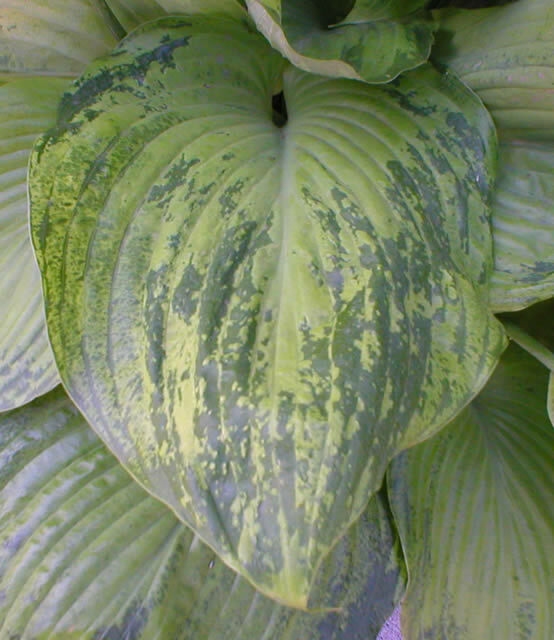 If you like the mottled look, the markings on these hosta varieties are not caused by Hosta Virus X. Exactly what causes these types of markings is still unknown. 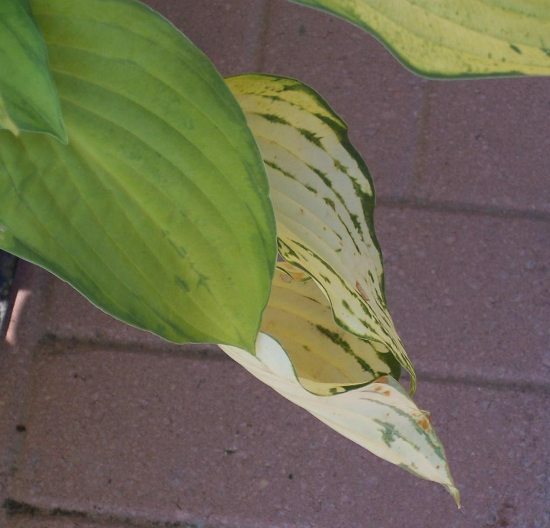 Visual symptoms can provide an initial diagnosis, but hostas can sometimes be virus free, yet show virus-like symptoms. Cold damage and light frost can cause damage that can appear similar to HVX. The only way to confirm Hosta Virus X is to test the plant. Many agriculture departments and universities can test for HVX. These "official" tests are most accurate, but can be expensive. Agdia, Inc. has an easy to use and relatively inexpensive test kit. Hosta Virus X ImmunoStrips are very reliable when used carefully according to the instructions. It may still be cheaper to destroy a very common suspect hosta and just buy a new one, but any growers and serious hosta collectors are wise to have a few HVX ImmunoStrip test kits on hand. 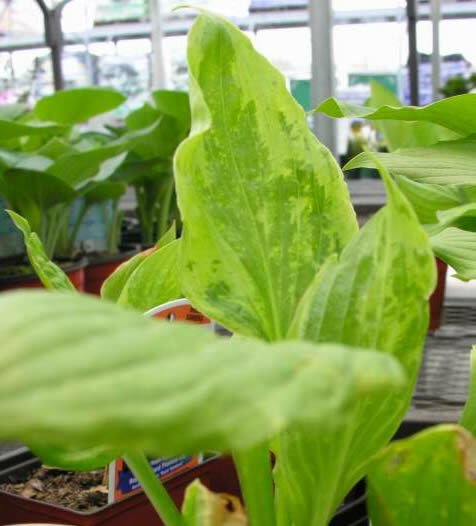 Hosta Virus X infected plants will not recover, so they must be prevented from spreading the disease to healthy hostas. 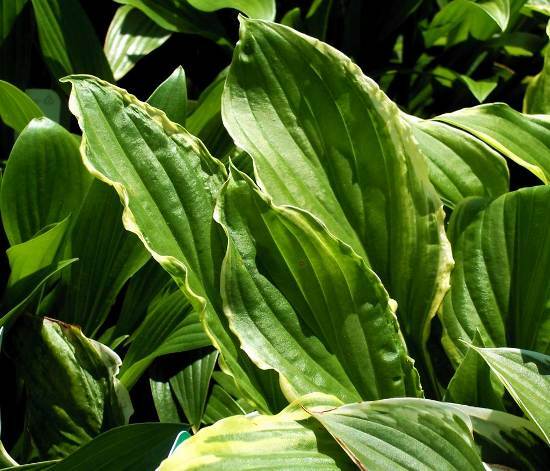 If you have a virus infected hosta in your garden, it should be destroyed immediately to prevent the virus from spreading to neighboring plants. Dig up the plant and send it to the landfill or burn it. Hosta Virus X was originally thought not able to survive in the soil after all infected roots had decomposed. Surprisingly, the most recent research shows otherwise, though we do not know exactly how long the virus can survive without a living host. 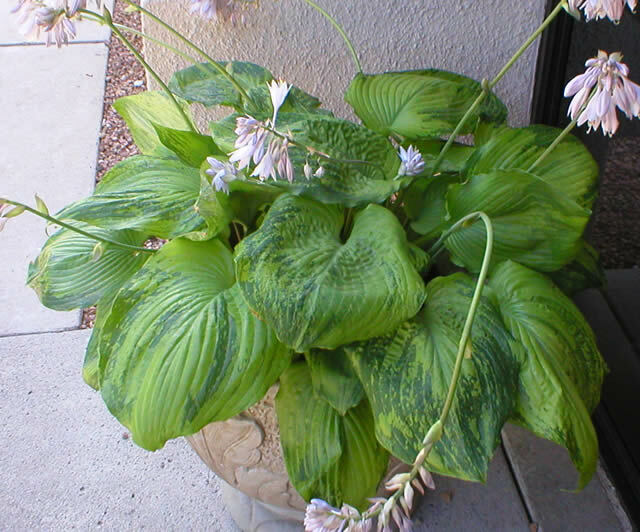 It is now recommended not to plant another hosta in the same location where an infected plant was removed. The reputable wholesalers and growers take this problem very seriously, but there are unscrupulous growers who do not. It is up to the home gardeners and collectors to protect their gardens. It is my personal feeling that these plants are like a ticking time bomb. As long as they are in the garden, they pose a threat. Retail nurseries are in an especially vulnerable situation. They often cut off bad leaves and scapes which puts them at high risk for infecting the rest of their stock. It would be a wise precaution to avoid cutting plants that came from suspected varieties and suppliers. Quarantining these plants in an isolated area for at least a year will allow time for symptoms to appear. There is still much to learn about Hosta Virus X, but we already know enough about this virus to make a difference. With careful observation and garden management, there is no need to panic or even worse...stop buying and growing hostas!! 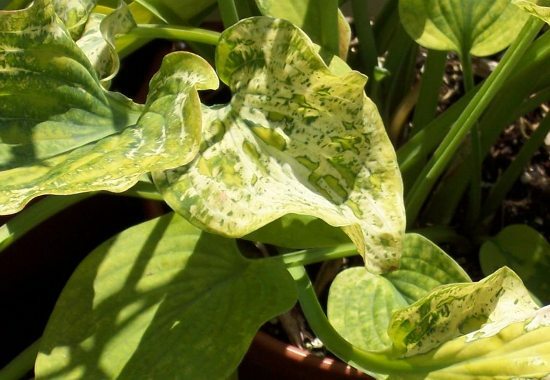 Even after all these years, there are still many gardeners, collectors, and even nurseries who have never heard of Hosta Virus X. Do your part to help educate hosta growers in your area about HVX. The following pdf document is a much condensed version of this article, but gets the main points across. Feel free to download it and print off copies for your favorite hosta friends and nurseries. Hosta Virus X Research - The latest research findings from Dr. Lockhart on behalf of the American Hosta Society. Be sure to look at the HVX Research Summary published in June 2010! Hosta Virus X - A Clear and Present Danger - Bill Meyer tells about his first encounter with HVX and explains how threatening this virus is. Warning - Hosta Virus X - A brief introduction to HVX with pictures of infected hostas. HVX Pictures - More photos of hostas that tested positive for Hosta Virus X.
Hosta Virus X Epidemic - A lengthy forum discussion on the HVX epidemic. Many photos included. Hosta Virus X - A new threat to one of our favorite shade perennials - Basic information and pictures of HVX. Also includes a Hosta Virus X Resistance List based on Dr. Ben Lockhart's three year trial study. Hosta Virus X - Basic information and pictures from the Missouri Botanical Garden. I am by no means an expert about Hosta Virus X!! If you have information, links, or photos that will make this article better, please email me at info@inthecountrygardenandgifts.com.